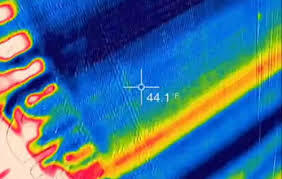 Utilizing a thermal image device of high quality can help us find or see things other inspectors can not see or locate. This is a new technology we are utilizing in the Home Inspection Industry in our area. See below and example of poor insulation in a ceiling of a home. Also photos show AC diagnostics indicating clogged cooling lines on AC units that reduce efficiency and cause the unit to work harder and fail sooner.